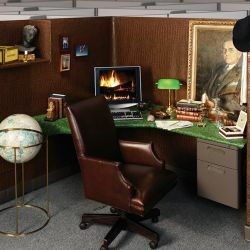 Wired continues it’s seemingly bi-monthly series of slideshows showing us either the best or the worst in cubicle living. In this case, it’s the best… 8 cubicles redesigned in creative ways. To quote Monty Python, where’s my medieval torture dungeon/philosophical salon-themed cube design?